In a small skillet over medium heat, sauté onion in olive oil until translucent. 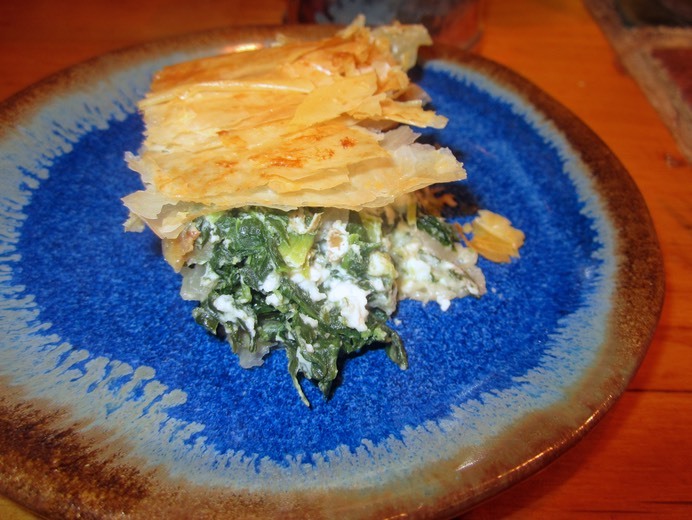 In a mixing bowl combine spinach, onion, walnuts, cream cheese, Feta cheese, eggs, nutmeg, and salt and pepper. Mix well – I like clean hands best for this job. Brush a 9 x 13 baking dish with melted butter. Brush a sheet of Filo dough with butter and lay in the dish, any edges hanging over the edge of the baking dish. Repeat with 4 more sheets of Filo. Spoon spinach filling into the baking dish on top of Filo dough..
Repeat the layers of Filo dough on top of the spinach filling, making five layers, and brush the top with butter. Fold over any edges into the pan and brush with remaining butter. Bake for 35 to 40 minutes until dough is crisp and lightly browned.